The Municipal Hall of Balete. Image source: Google Earth Street View. Section 1. Barrios Malabanan, Looc, Alangilan, Palsara, Makina, Magapi, Solis, Sampalukan, Calawit, and Balete, and the sitios of Sala, Paligawan, and Wani-Wani in the City of Lipa, are separated from said city and constituted into a distinct and independent municipality, to be known as the Municipality of Balete, Province of Batangas. 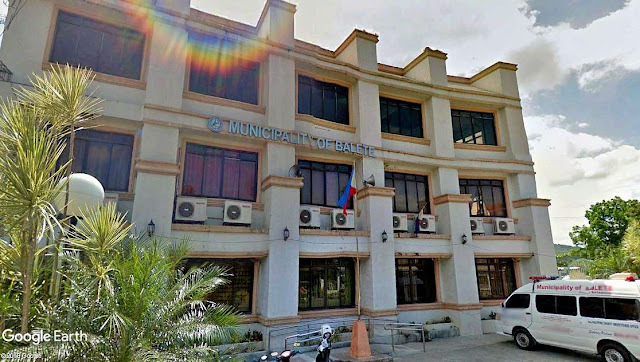 The seat of government of the new municipality shall be in the present site of Barrio Balete. Upon the approval of this Act, all the aforementioned sitios shall automatically be converted into barrios. Sec. 2. The first mayor, vice-mayor, and councilors of the new municipality shall be elected in the next general elections for local officials. Sec. 3. This Act shall take effect upon the qualification of the mayor, vice-mayor and councilors elected.